So I dragged my heels on this one a little bit. I’m fatigued with the whole Britney Spears Fantasy line, to be honest. Fantasy, itself, is an icon of celebrity fragrances and its flankers are nothing to be sniffed at either. Though they aren’t so unique that if you passed on them, you’d miss out. In Bottle: Circus Fantasy does clean! That’s a nice mix up from the fruitiness of the other two Fantasy scents I’ve tried. It smells like a very sweet glass of lemonade. Applied: Sweet citrus up front and the citrus is a quick fader so we get down to business rather quick. Heading into the rest of the opening, Circus Fantasy hits up a sweet berry note and falls into a pile of pretty little violets right away. The mid-stage is a more floral fragrance, doing a mixture of sweet and clean florals rather well as the scent hits up peony and orchid. It smells really similar to a bunch of other celebrity fragrances in the mid-stage with that sweet floral heart that’s so recognizable. At least it’s easy to accept and wear! The dry down is an uninspired array of vanilla and sugar with a jolt of clean dashed in there for good measure. Overall, Circus Fantasy does clean and refreshing rather well. The mid-stage bores me a bit along with the end stage but the opening was pretty good. I liked the lemonade smell and wished we had gotten more of that. Extra: Now the only fragrance in the Fantasy line that I haven’t gotten my nose on yet is Hidden Fantasy. That’s the red one. I can’t seem to find it anywhere but online and I would like to avoid getting more than a decant or sampler spray of it so until I track it down, I’m sure Britney’s perfume line will come out with another Fantasy flanker. Design: Still hate the bottle. Sorry guys. It will probably never look any better no matter what they do with it. 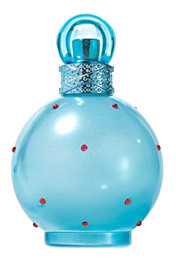 Circus Fantasy is an appealing shade of blue at least, with red rhinestones set into the bottle’s glass. Notes: Raspberry, apricot, lotus, orchid, peony, vanilla, sugar, musk. Move over Midnight Fantasy, Circus Fantasy’s got you beat. I really do like that lemonade opening and wish they could have just bottled that for all three stages. Reviewed in This Post: Circus Fantasy, 2009, Eau de Parfum. This entry was posted in floral, fresh, Reviews By House, spin off and tagged apricot, lotus, musk, orchid, peony, raspberry, sugar, vanilla. Bookmark the permalink.